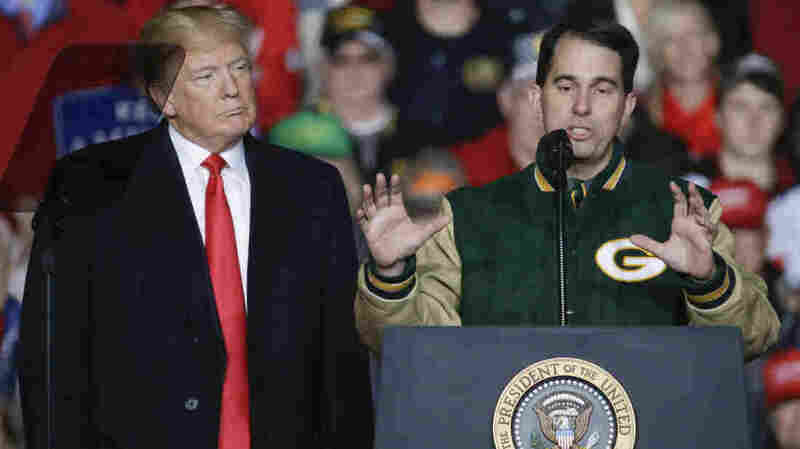 Governors' Races: Scott Walker Loses in Wisconsin; Kris Kobach Projected To Lose Kansas Democrats made modest inroads on the GOP's commanding lead in governors' offices around the country. But did not fare well in marquee races in Florida and Georgia. With President Trump at his side, Wisconsin Gov. Scott Walker speaks during a rally in Mosinee, Wis., on Oct. 24. Democrats made modest inroads against the GOP's commanding lead in governors' offices around the country after Tuesday's midterm elections. But two of their marquee candidates appear to have fallen short. And Republicans are projected to continue to hold power in the 2020 presidential battlegrounds of Florida and Ohio. Republican Gov. Scott Walker lost his bid for a third term in Wisconsin. And Republican Kris Kobach — the firebrand secretary of state who co-chaired the president's short-lived commission on election integrity — lost the Kansas governor's race to Democrat Laura Kelly in the traditionally deep red state. But a Republican in the mold of President Trump is projected to win the governor's office in Florida, and another leads in Georgia — both states where African-American candidates hoped to break new ground for Democrats. Rep. Ron DeSantis, R-Fla., bested Tallahassee Mayor Andrew Gillum in the Florida governor's contest, the AP projected. In Georgia, Brian Kemp, the Republican secretary of state, is leading former state lawmaker Stacey Abrams in election returns, although early Wednesday morning Abrams vowed not to concede that state's governor's race until every vote was counted. Former Sen. Mike DeWine, R-Ohio, is projected to beat Democrat Richard Cordray and replace Ohio Gov. John Kasich, who is termed-limited out of office. Like DeSantis in Florida, DeWine could be an important ally for the president in a state that is likely to be a key presidential battleground in two years. Democrats fared better in governors' races in the Midwest and the West. Democrat Tony Evers is projected to unseat Walker in Wisconsin. J.B. Pritzker is projected to topple Republican Gov. Bruce Rauner in Illinois — one of the nation's least popular governors — after spending more than $170 million of his Hyatt hotel fortune on the contest. Democrats are projected to win seats held by retiring GOP governors in Michigan, New Mexico and Maine. After big gains over the past decade, Republicans went into Tuesday controlling two-thirds of governors' offices around the country. Democrats cut into that margin Tuesday but still trail in the nationwide tally. Although Gillum and Abrams were stymied in their efforts to break the color barrier in the Deep South, there were some other notable firsts. Republican Kristi Noem is projected to win her race to become the first female governor in South Dakota. And Democrat Jared Polis is projected to win in Colorado to become the nation's first openly gay man to be elected governor.